OWND stands for Oxygen, Water, Nutrition, and Dog. It was developed by Air Press, which calls itself a "medical relaxation salon" and it makes similar oxygen capsules for humans. The idea behind the OWND Cafe is that humans who are out and about with their pets can stop by one of the Cafes and enjoy the benefits of oxygen therapy together. After their 20 - 30 minute sessions, the owner and pet can share a treat. This sure beats the monotony of tossing a ball again and again. 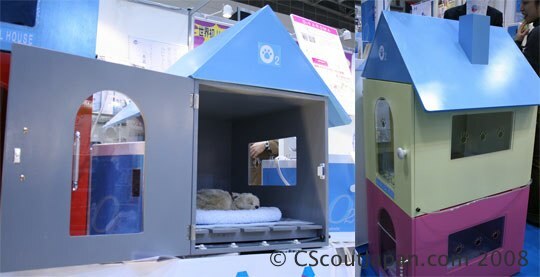 Also this year, Nippon Relax introduced the O2 Doghouse for home oxygenation, a kind of custom dog hospital. 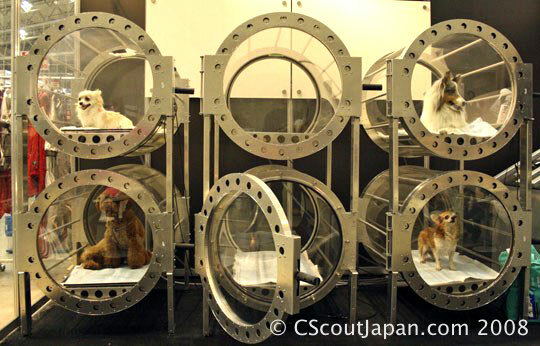 With the O2 Doghouse, you can even share the oxygenating experience with your dog from the same oxygen generator. Are these machines as ridiculous an idea as they may first appear? I'm not so sure what the long term effects of occasional oxygen therapy are. But, however we get it, all of us, our pets, our plants, all living things, need to find alternative sources of oxygen, as every year there is less oxygen available to us in our air and food supply.